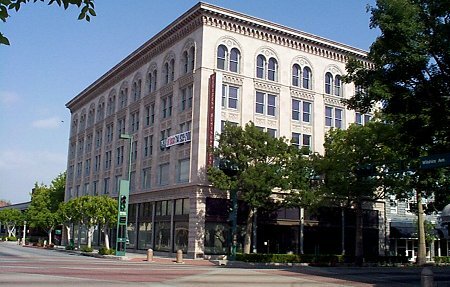 Designed by Anaheim architect M. Eugene Durfee, the Chapman Building is Fullerton's most outstanding commercial structure. Its design is a combination of the Chicago School of skyscraper architecture, as developed by Louis Sullivan, and a Southern California ethic. The building is five stories in height with a basement; the basement extends approximately four feet under the public sidewalk on both Wilshire Avenue and Harbor Boulevard and is partially lighted by glass blocks in the pavement. The ground floor is open for retail space and includes a mezzanine level. A stairwell and elevator from the north entrance that is protected by a small marquee provide access to the upper floors. The design of the west and north façade of the building's upper levels - a classic placement and treatment of windows, the highly decorative cornice, and the use of masonry (terra cotta) for the exterior - reflects the Chicago School style. The east and south façades are painted brick with no ornamentation. Constructed for Charles C. Chapman, Fullerton's first mayor and a well-known businessman, the structure's 65-foot height was the tallest in Orange Country when built in 1923. The 1920s in Orange County were prosperous, and the Chapman Building was the result of the unbounded optimism of the times. The original plans called for a three-story structure for a department store and offices; these plans were revised to add two more floors. 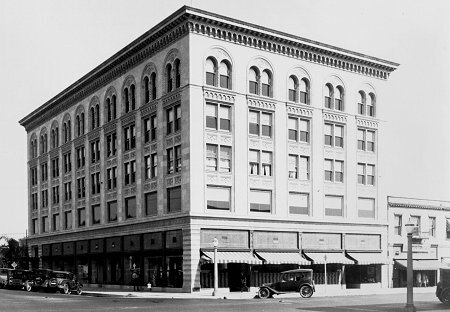 The Chapman Building is a good example of how commercial architecture in California in the early part of the 20th century reflected the background of its transplanted property owners. Instead of developing a native style, the architecture was usually imported from other parts of the country, just like much of the population. Charles Chapman began his entrepreneurial career in Chicago in the 1870s, leaving for California in 1894, when the Chicago Skyscraper style was at its peak. When the opportunity arrived, it was natural for Chapman to attempt to recreate this architecture in Fullerton. In using the style of Louis Sullivan, Mr. Durfee evidently "borrowed" some of the detailing from Sullivan's Bayard Building, constructed in New York in 1897. In the building's early years, a department store occupied the first floor and the upper floors were offices. Starting in the 1950s, the property suffered a 30-year decline in use and maintenance with much of the building remaining vacant. In conjunction with the construction of a public parking structure at its rear, the Chapman Building was completely restored in the 1980s with a bank becoming the major tenant on the ground floor. In 1997, the building was upgraded again to meet seismic safety standards without compromising the exterior façade.